Why hang back with the crowd? Make sure your message leaps out in front of potential customers with StoreSMART's Shelf Talkers! These breezy, playful labels are designed to slip inside the "snap-in" grooves present on many store shelves. 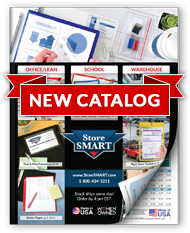 We can custom print information about your products, ongoing specials, and other information. In a saturated marketplace, these tags could make all the difference when it comes to gaining your rightful share of customer attention. Crafted of 0.010" gloss white plastic. Designed to fit into the "snap-in" grooves on the edge of store shelves. Overall size: 4 5⁄8" x 8 ½". Sunburst size: 4 5⁄8" x 3 ½". One-time die, setup, and digital proof fee of $50. Double-sided tape for shelf attachment. To order, click here or call 800-424-1011 or 585-424-5300.